Say: "O Allah, send Your Salah upon Muhammad and upon the family of Muhammad, as You sent Your Salah upon the family of Ibrahim, verily You are the Most Praiseworthy, Most Glorious. O Allah, send Your blessings upon Muhammad and upon the family of Muhammad, as You sent Your blessings upon the family of Ibrahim, verily You are Most Praiseworthy, Most Glorious.'''' This Hadith has been recorded by the Group in their books with different chains of narration. As You sent Your Salah upon Ibrahim, and send Your blessings upon Muhammad and the family of Muhammad, as You sent Your blessings upon Ibrahim and the family of Ibrahim. This was also recorded by An-Nasa'i and Ibn Majah. Say: "O Allah, send Your Salah upon Muhammad and his wives and offspring, as You sent Your Salah upon Ibrahim, and send Your blessings upon Muhammad and his wives and offspring, as You sent Your blessings upon the family of Ibrahim, verily You are Most Praiseworthy, Most Glorious.'''' It was also recorded by the rest of the Group, apart from At-Tirmidhi. Whatever you want, but if you increase it, it will be better for you. The angel came to me and told me, "O Muhammad, would it not please you if your Lord, may He be glorified, says: `No member of your Ummah sends Salah upon you but I send Salah upon him tenfold, and no member of your Ummah sends greetings of Salam upon you but I send greetings of Salam upon him tenfold''' I said, "Of course.'' This was also recorded by An-Nasa'i. 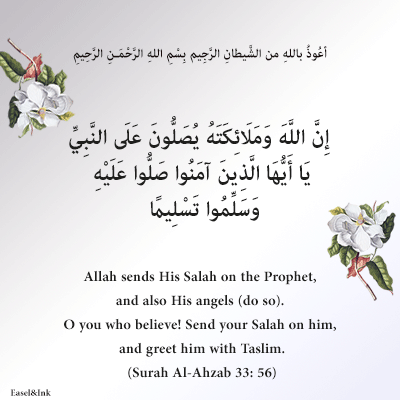 Of course just now someone [an angel] came to me from my Lord and said, "Whoever among your Ummah sends Salah upon you, Allah will record for him ten good deeds and will erase for him ten evil deeds, and will raise his status by ten degrees, and will return his greeting with something similar to it.'''' This is also a good chain, although they (Al-Bukhari and Muslim) did not report it. Send Salah upon me, for this is Zakah for you, and ask Allah to grant me Al-Wasilah, for it is a position in the highest part of Paradise which only one man will attain, and I hope that I will be the one. This was recorded only by Ahmad. The miser is the one in whose presence I am mentioned, then he does not send Salah upon me. ...and he does not send Salah upon me. It is recommended to conclude supplications with Salah upon the Prophet . A supplication remains suspended between heaven and earth and does not ascend any further until a person sends Salah on me. Do not treat me like a spare water container, send Salah upon me at the beginning of your supplication, at the end and in the middle. "and may Allah bless Muhammad.'' at the end of this Qunut. This was also recorded by Abu Dawud, An-Nasa'i and Ibn Majah, and it was graded Sahih by Ibn Khuzaymah, Ibn Hibban, Ad-Daraqutni and An-Nawawi in Al-Adhkar. Source: Tafsir ibn Kathir Abridged version.